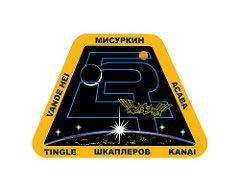 Mission pin for the 54th Space Station Expedition. Expedition 54 to the International Space Station is a six-person mission that began in December 2017 and will continue through March 2018, when Expedition 55 begins. On May 8, 2017, the Expedition 54 crew posed for a group portrait. 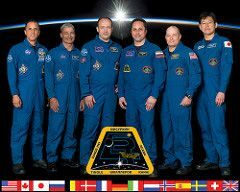 From left to right: NASA astronauts Joe Acaba and Mark Vande Hei, Russian cosmonauts Alexander Misurkin and Anton Shkaplerov, NASA astronaut Scott Tingle and Japanese taikonaut Norishige Kanai.